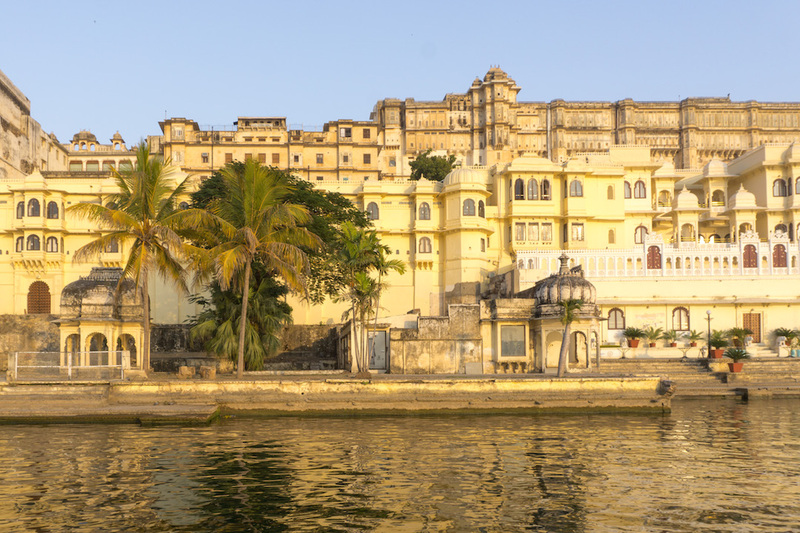 Udaipur, in my opinion, is the most beautiful city in Rajasthan. It’s called the City of Lakes, after the five artificial lakes that give the city most of it’s beauty. 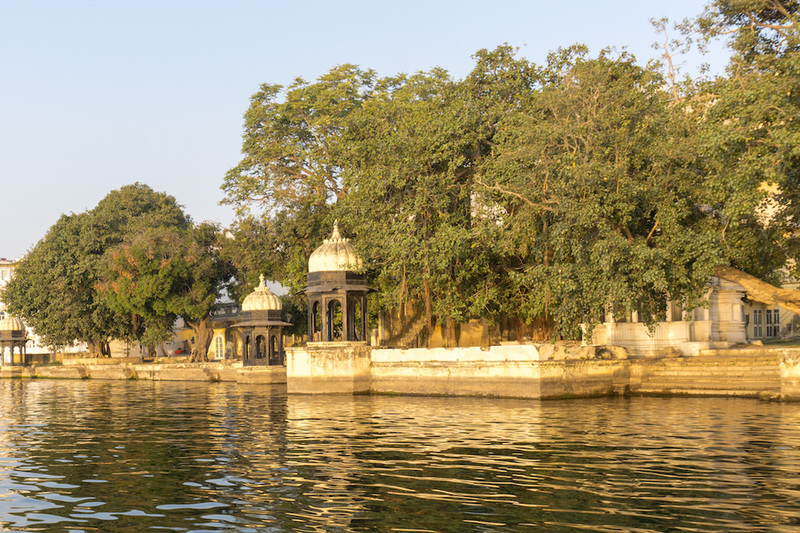 The oldest lake, Lake Pichola, was built in 1362, and the rest followed over the centuries. 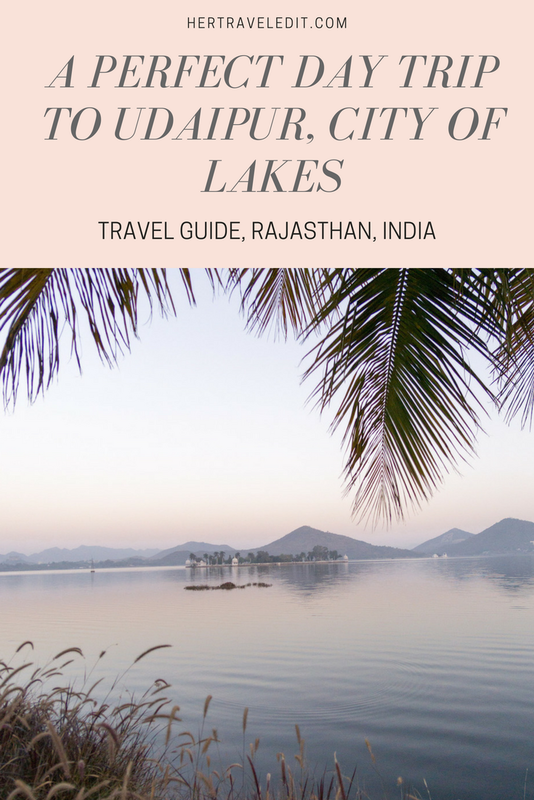 Most of this itinerary is centered around Lake Pichola, but it also involves two other lakes – Lake Fatehsagar, and my personal favorite Doodh Talai Lake. 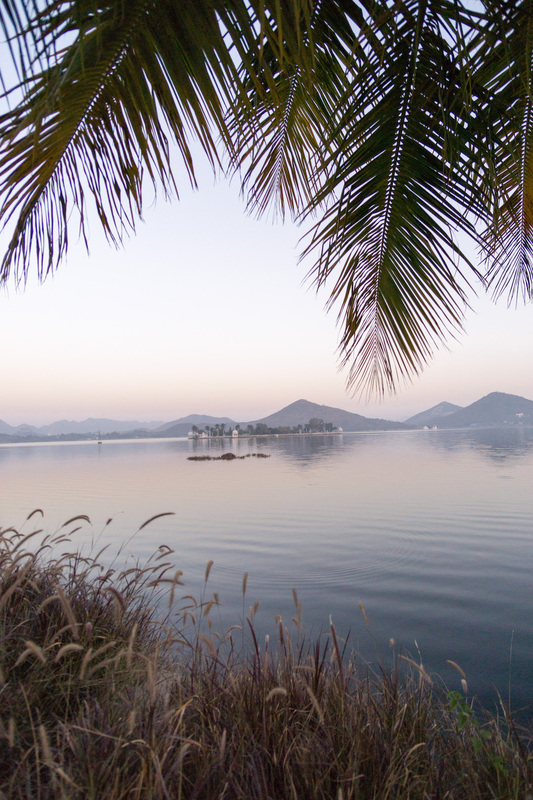 Unless you are staying near Lake Pichola, start your day with sunrise at Lake Fatehsagar. It is so calm, pink and relaxing! The chirping birds will help you with a quick meditation, a lovely beginning to a possibly hectic day! 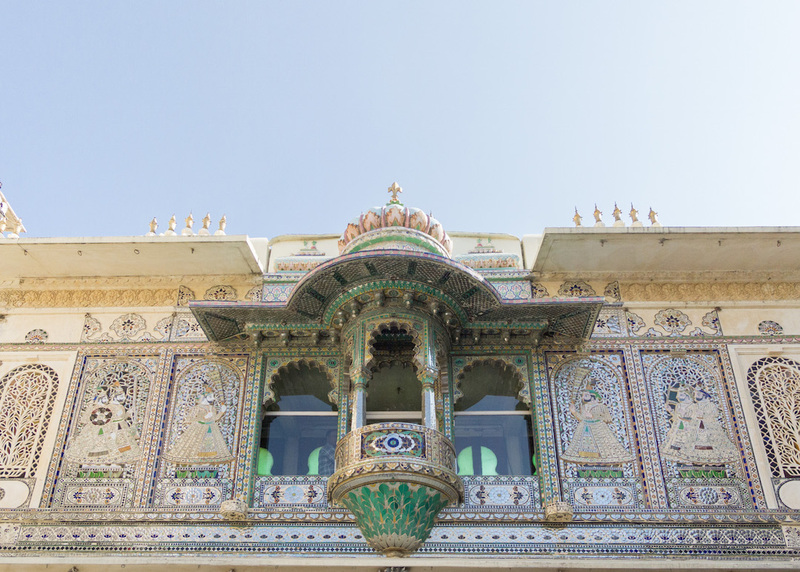 After a good breakfast, head to Udaipur’s City Palace. 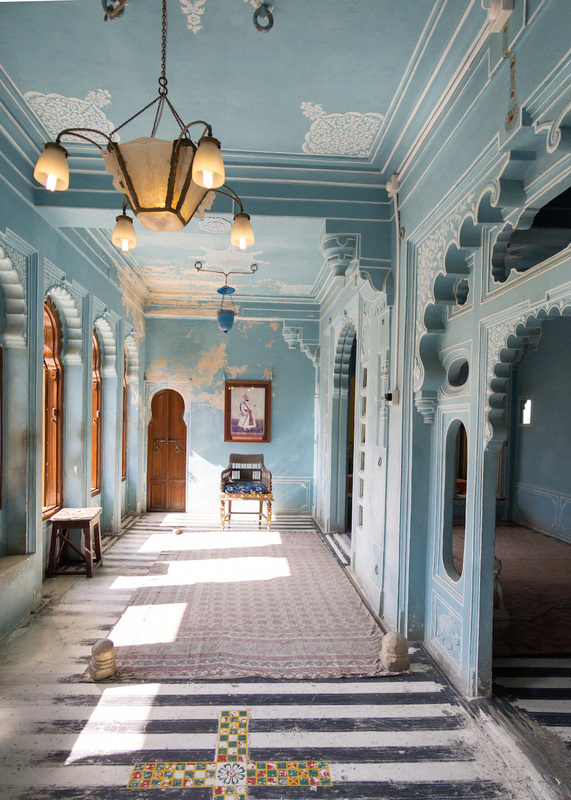 This is a palace worth visiting, so if you only visit one palace in Rajasthan, make it this one! It’s huge, and could easily take 3 – 4 hours, based on how long you spend taking pictures. 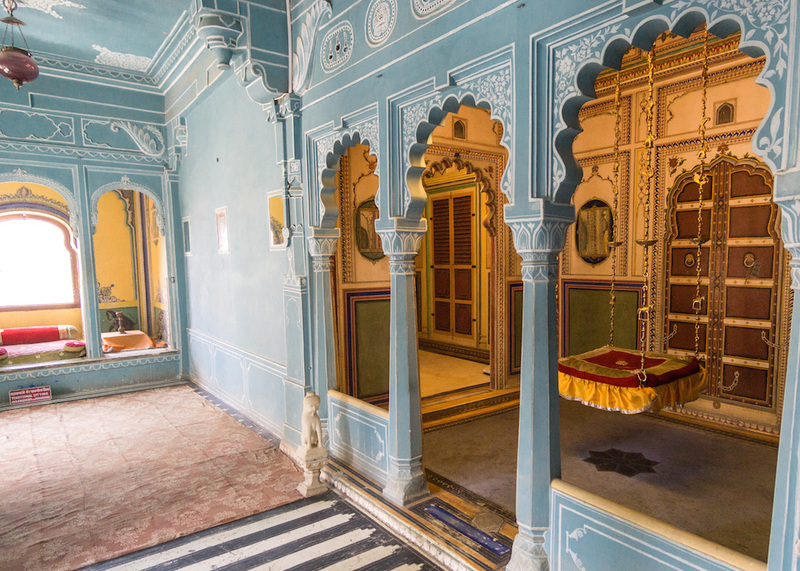 You could either hire a private guide to explain the history behind each room, or you could take audio guides (recommended, so that you can set your pace). Definitely choose one or the other, else you will be wandering about rather aimlessly. And even if you aren’t into history, it’s still very pleasing on the eyes! 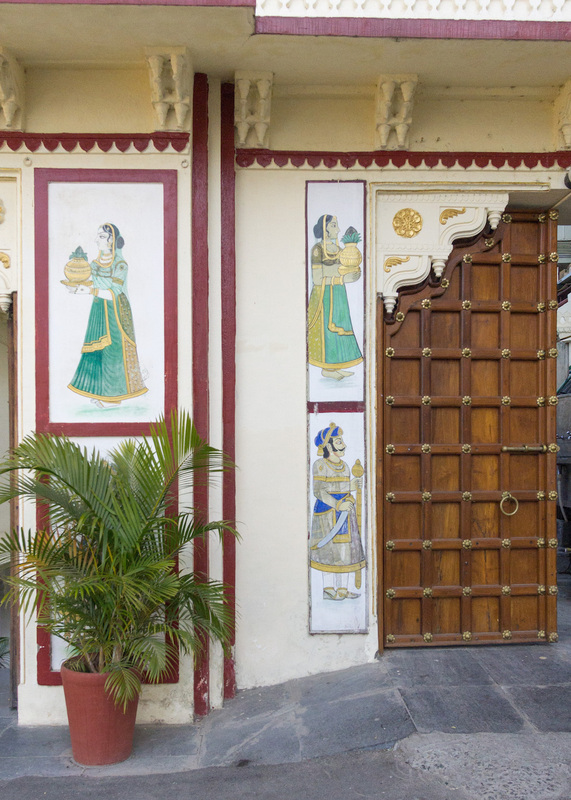 My favorite part of the City Palace was actually all the cute doors I encountered on the way in! To be honest, I got bored about three-quarters of the way through, but once you enter, there’s no way out but to complete the circuit. Inspired by Ikea maybe? 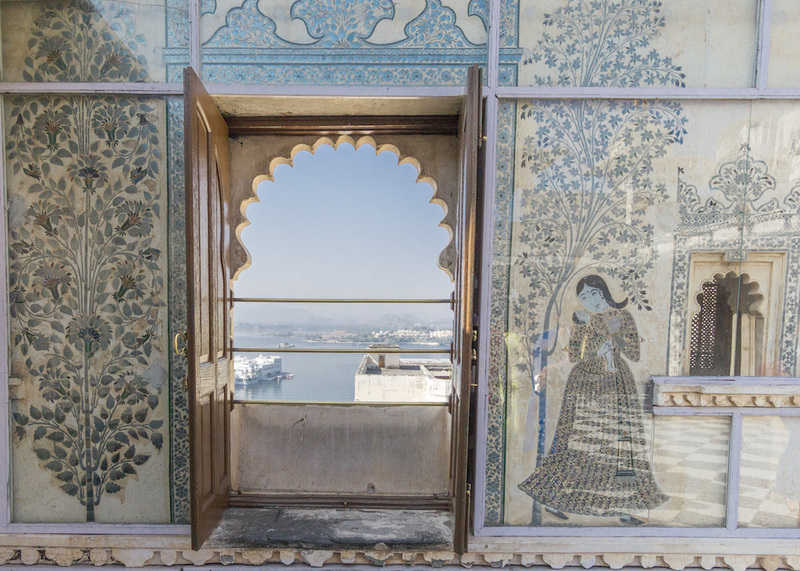 Don’t forget to look outside the windows at the palace for some stunning views!! Once you are exhausted with the City Palace, it will be lunch time. I’d recommend trying a traditional Udaipuri vegetarian “thali” (a collection of several dishes from a particular region). 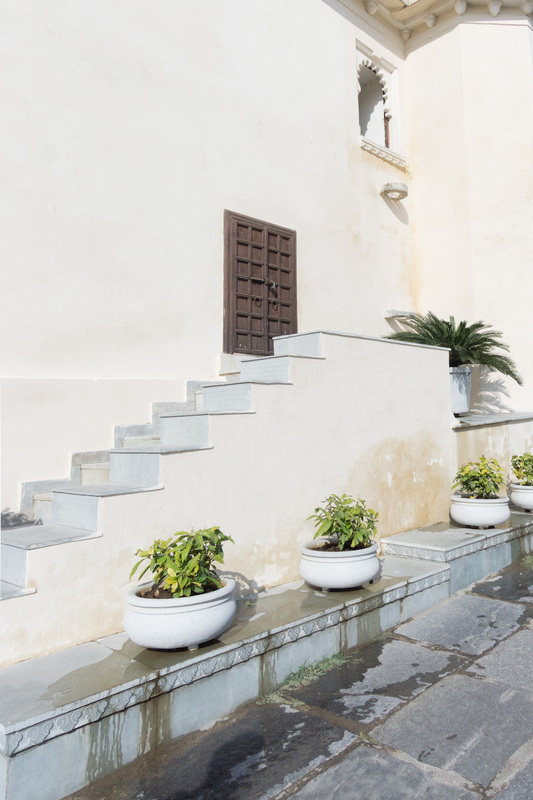 There are several restaurants around Lake Pichola, Ambrai Restaurant and Upre Restaurant are highly recommended. 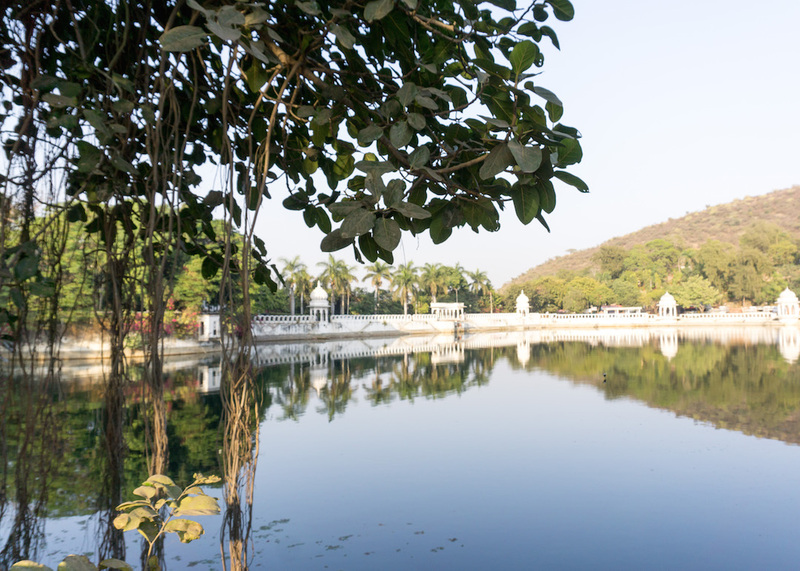 Note : You cannot bring a car to either of these, they are located on Lake Pichola and can only be reached by rickshaw, foot, or bikes. 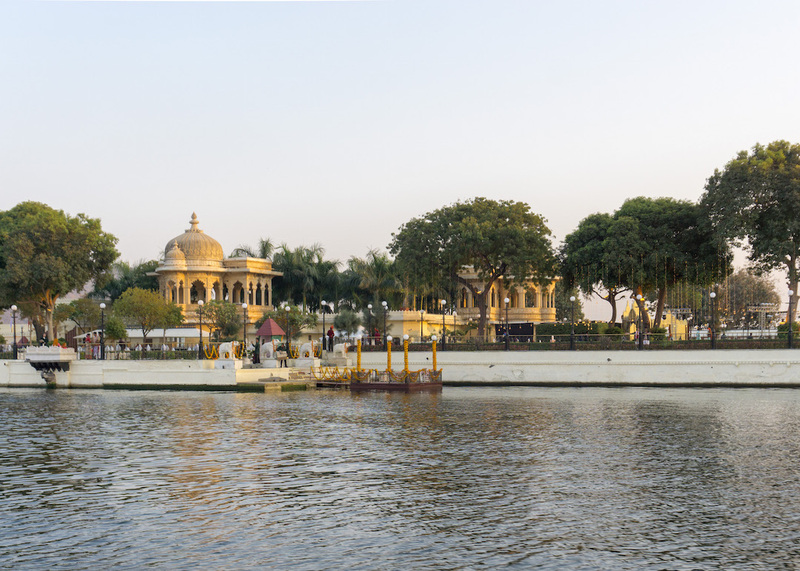 Another option is to buy a boat ticket from the City Palace, which this will take you to Jagat Niwas Palace on Lake Pichola. 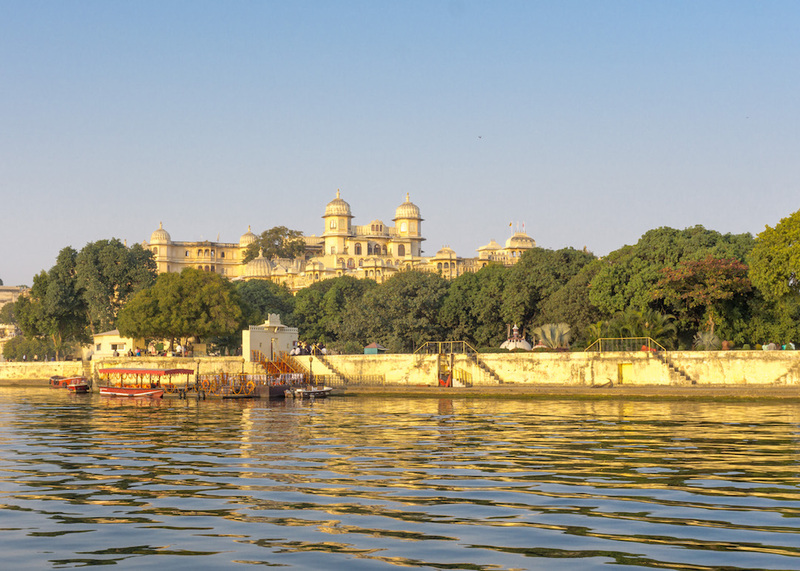 To my knowledge, only boat tours from the City Palace are allowed to dock at Jagat Niwas Palace. 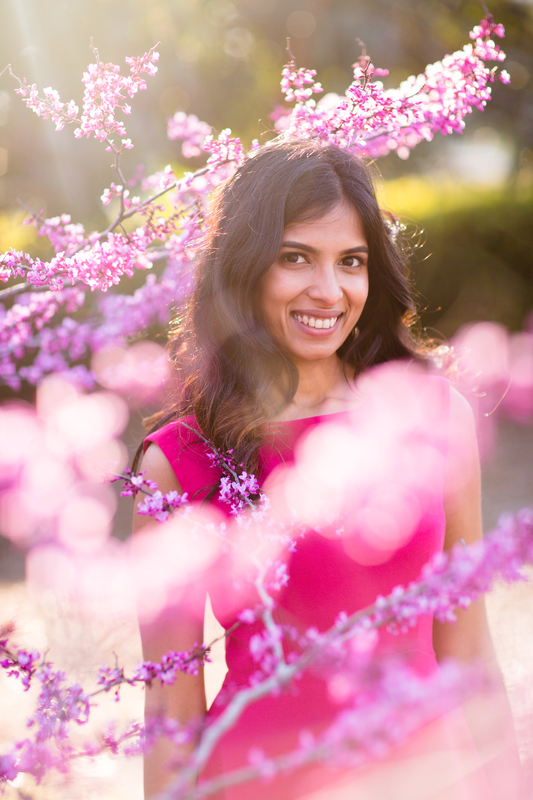 We opted to take a boat out on the Lake during golden hour however, when everything is so much prettier! 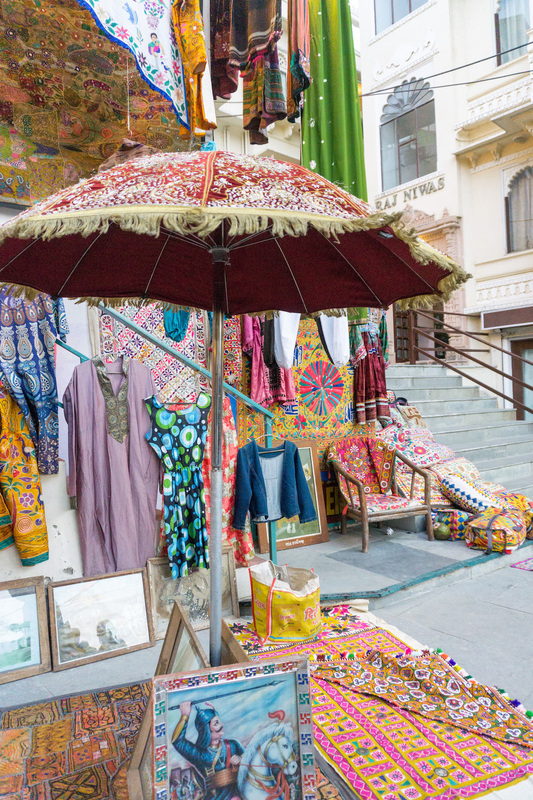 After lunch, walk around the city center for some shopping (or window shopping!). As noted above, you would have to park your car outside. 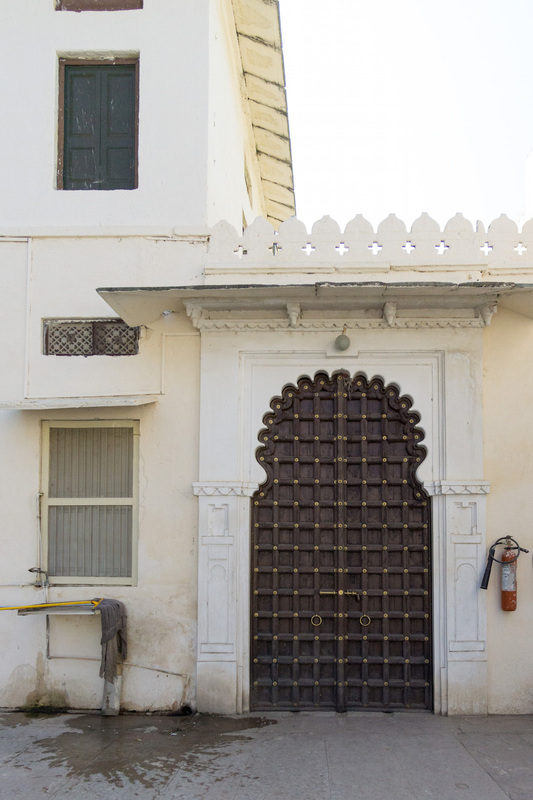 I loved walking around the old city, and of course admiring all the doors and windows! 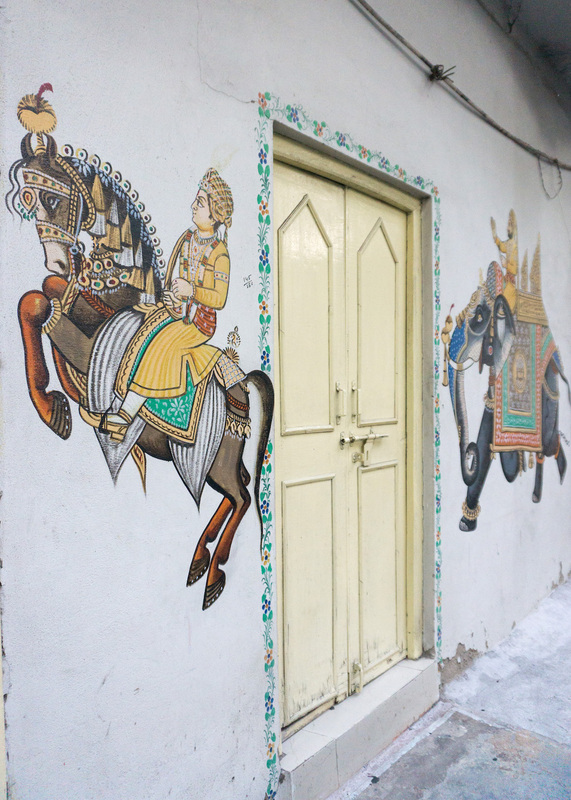 (Walking in the older parts of cities in India really shows you how harmoniously everyone lives. Yes there is chaos, but there is harmony within it. The humans and animals (mostly street dogs, cats and cows) all live and hang out together in tight places, none the worse for sharing). 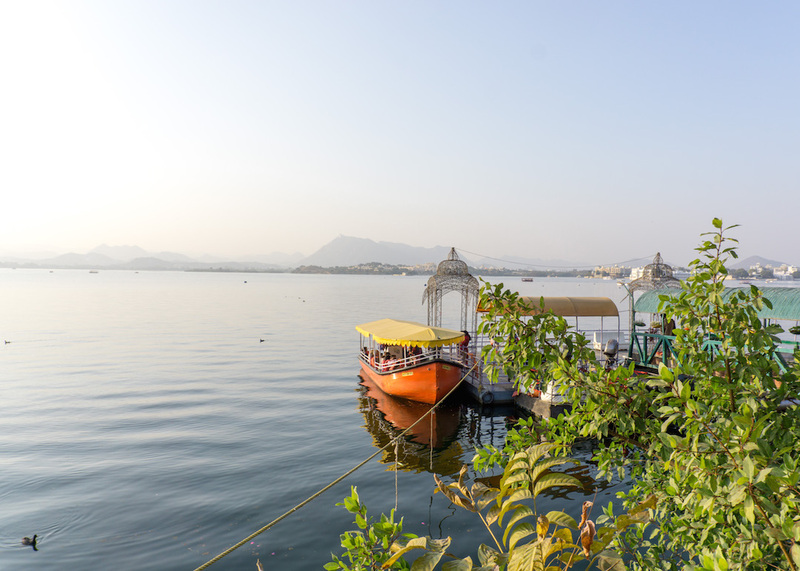 After some rest, it’s time for a boat ride on Lake Pichola! 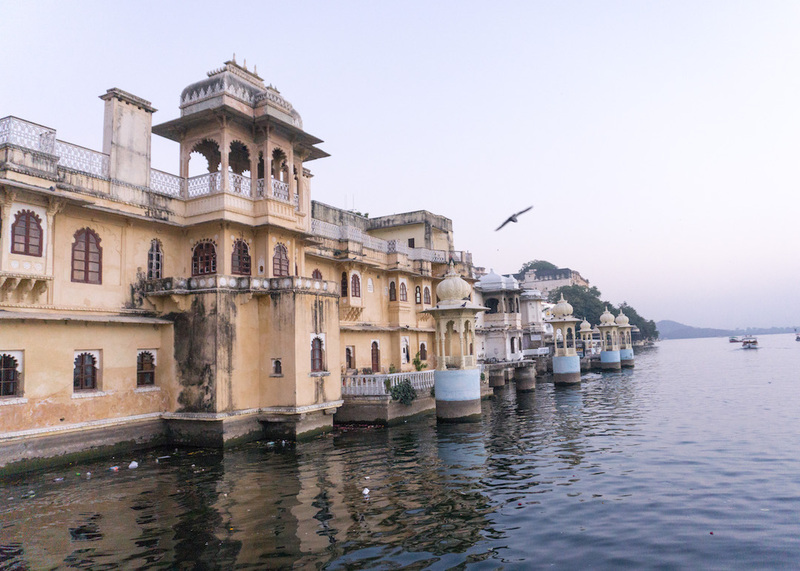 Don’t let anyone trick you into renting a boat on any other lake – Lake Pichola is where you want to be. This is because you get gorgeous views of the City Palace, the uber fashionable (and uber expensive!) 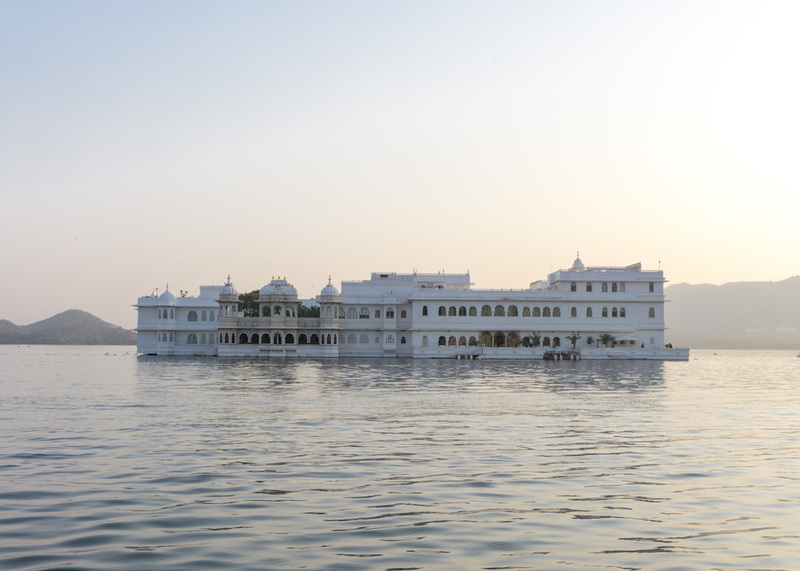 Taj Lake Palace Hotel, Jagat Niwas Palace and the Ghats (my favorites, keep reading!). 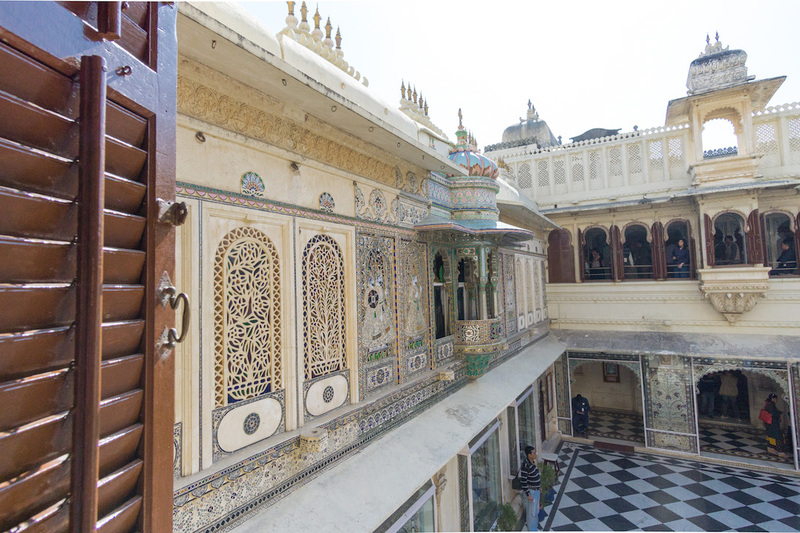 Gorgeous views of the City Palace! We rented a private boat (with a driver!) from Yash Amusement near Doodh Talai Lake. He was excellent, and our 15 min boat ride was one of the highlights of our trip! The peacefulness on the lake is much needed after walking in the city. Another important reason for choosing Yash Amusement is that you will get to see Doodh Talai Lake, an amazing bonus! 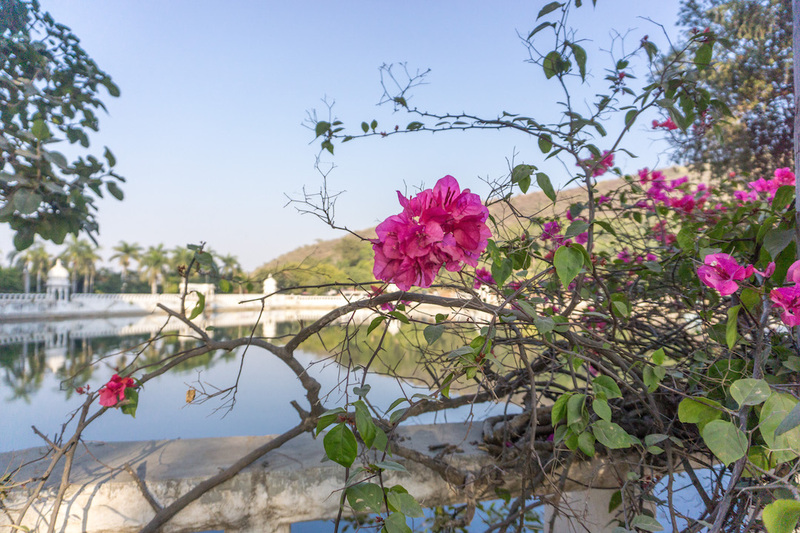 This cute little lake, surrounded by bougainvillea, trees and creepers was my personal favorite in Udaipur! 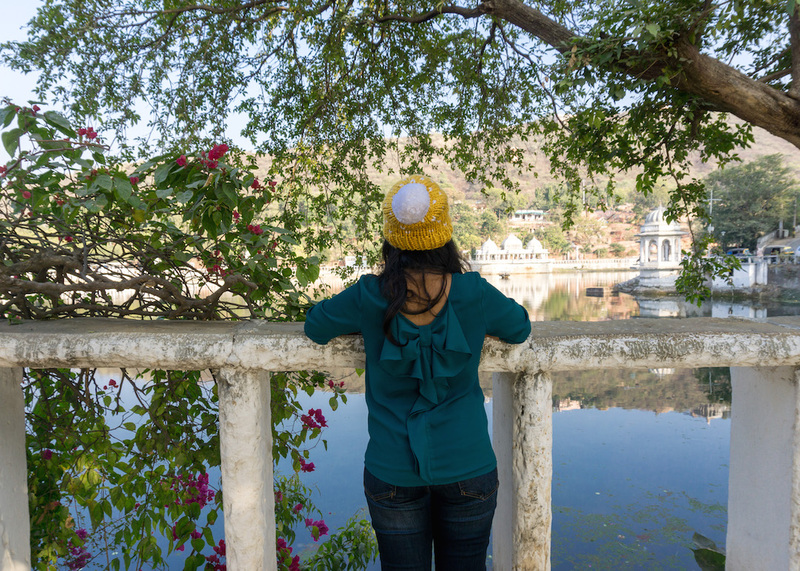 Admiring Doodh Talai Lake. Beanie by Lotus Knit Shop. 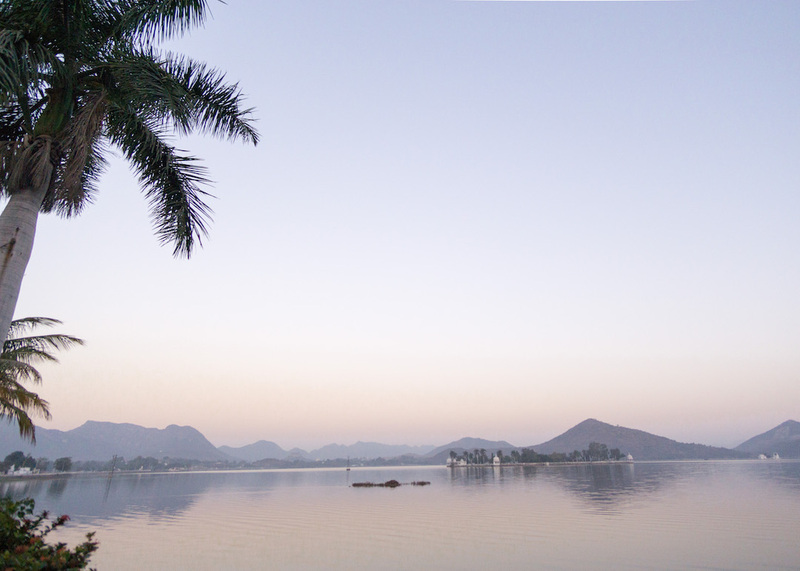 Udaipur does get chilly in the winter mornings and evenings! Trust me, your day isn’t over yet! 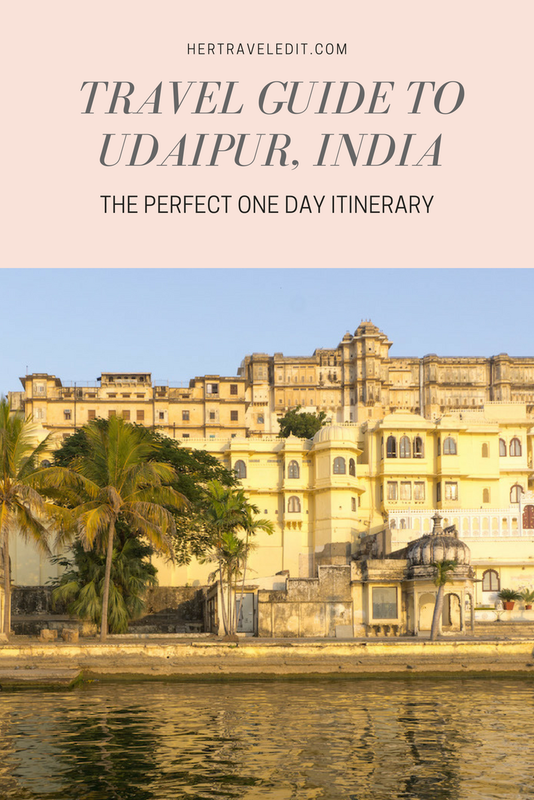 You have to get back to the old town (which isn’t too far) and catch the sunset by Gangaur Ghat. On the way, you could also make a quick stop at Lal Ghat. 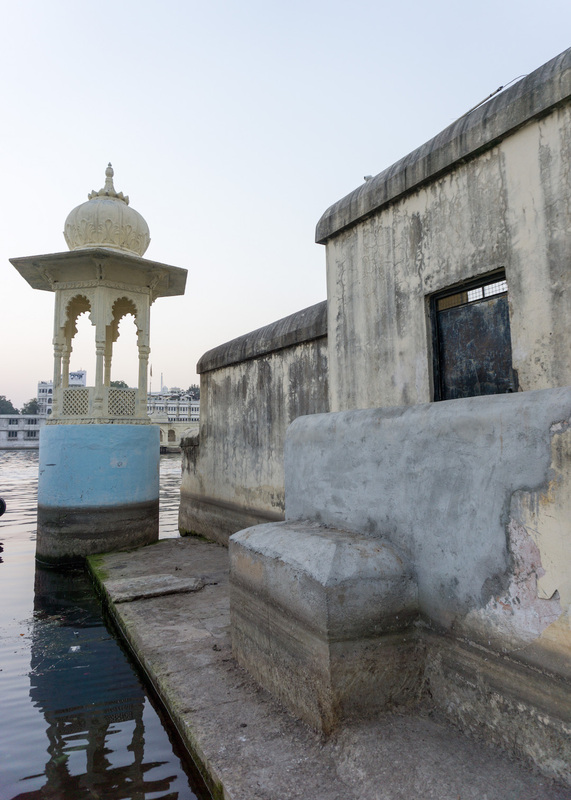 A Ghat is basically a name for a place that has steps leading to a body of water, usually used during Hindu rituals and festivals. The important Gangaur festival (spring celebration) is celebrated at Gangaur Ghat. Gangaur Ghat at other times is still a gorgeous place to visit. Seeing the sunset from there, so close to the hustle and bustle of the town, and yet so peaceful, is an amazing experience! I hope you enjoyed your day in Udaipur!! I highly recommend staying one or even two more days, because there is so much more to see! 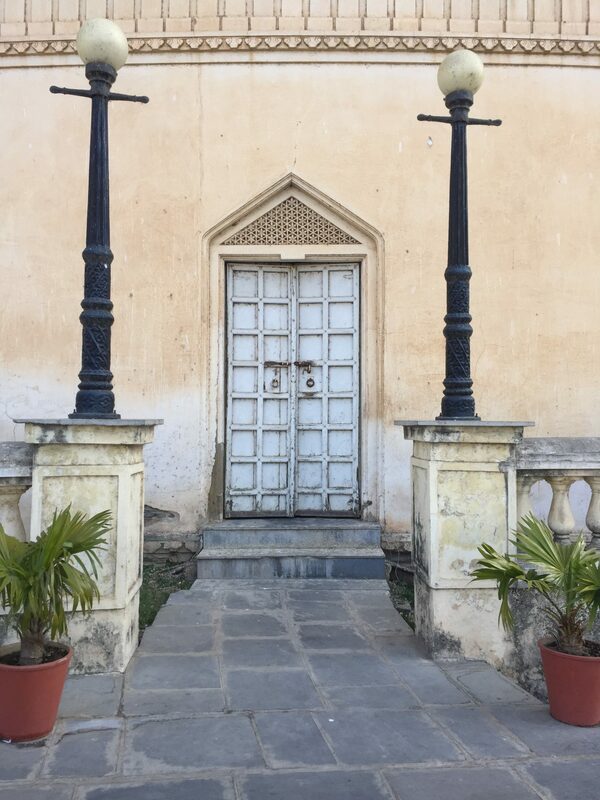 If you want more tips from me on Udaipur, check out my Instagram feed for Udaipur pictures, and Instagram Story Highlights (only available in the app) on Udaipur! 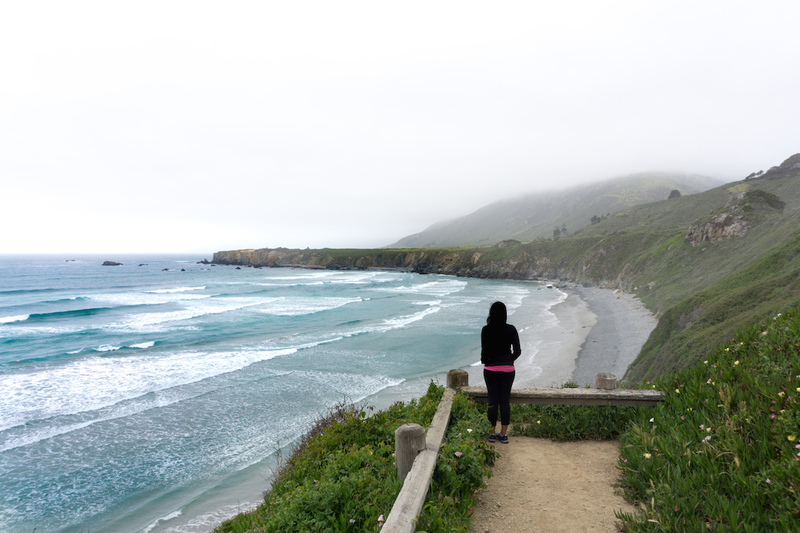 Do you use Pinterest for trip planning? Pin this post for future reference!